The future of one of Wolverhampton&apos;s premier live music venues - closed for refurbishment since January - remains shrouded in mystery. And council bosses still uncertain when work will be completed and how much it will cost. 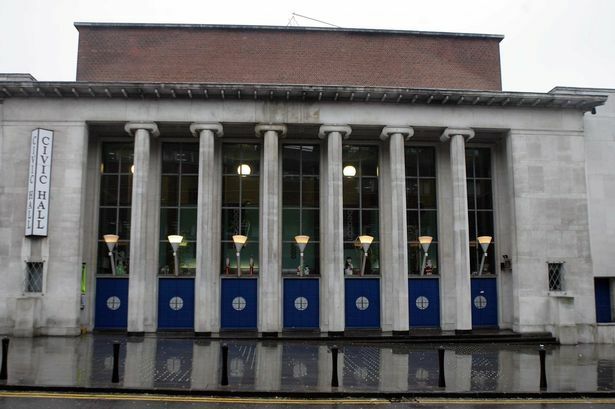 Essential repairs and a complete overhaul of the 80-year-old Civic Hall was scheduled for completion by October 2018, at an estimated total cost of £14.4 million. But following the discovery of unforeseen structural problems with the Grade ll listed building in North Street, the refurbishment work has now gone overdue - and is already costing an extra £23.6 million than originally planned. However, frustrated music fans have been left scratching their heads as to when the venue will actually reopen and how much the work will cost once it is finally completed. Self-employed organic gardener and music fan Steve Bradley, from Penn, said: "The city badly needs a functioning Civic Hall. "It&apos;s the jewel in our crown, culturally speaking, and vital as a linchpin in Wolverhampton&apos;s night-time economy, while also having a crucial role in driving footfall to the city during the day by staging hugely popular events such as the West Midlands Vegan Festival. "I can&apos;t be the only citizen to detect a lack of urgency in the work that is being carried out there. "I know about the delays caused by structural problems and the attendant increase in costs but I can&apos;t stress strongly enough how vital it is that the venue reopens promptly. "I fear that the project has lost momentum and that promoters and artists will look elsewhere, wiping the Civic off the map. They need to get a move on. The silence is deafening." Mr Bradley, who has consistently attended gigs at the venue for more than 25 years, said his most memorable nights among many visits included gigs by Elvis Costello and The Attractions, Robert Plant, Bellowhead and Sigur Ros. Fellow gig-goer Andy Hyatt added: "I have been to many music venues in the Midlands and the Civic is probably the best one I have attended in terms of size, sound, facilities and atmosphere. "The extended closure has been a disaster for music in Wolverhampton and for the city in general. Bands that would have played here are now going to Birmingham and I don&apos;t think they will come back." Chris Potts, from Bilston, said: "To have such a lack of a grasp over what&apos;s going on with a building which has been in the council&apos;s ownership since its inception, and to misunderstand the implications of improving a fairly small footprint of entertainment in the city, it seems to me that the council appears to be unfit to manage the renovation of the Civic Halls. "To oversee an already eye-watering cost for improvement and to watch that figure go into outer space is irresponsible. "Now people are talking about the cost being £38 million, with this saga continuing until at least 2021. By 2021 people in Wolverhampton will have forgotten the Civic Halls ever existed. "It seems to me that the councillors in the Civic Centre are keeping their heads down so much that they may not even know where the Civic Hall is. Otherwise at least one would have summoned up enough courage to demand a detailed analysis of the monstrous sums of money being spent." Councillor Craig Collingswood (Lab. Park) recently undertook a site visit to the Civic Hall with colleagues to check on the progress of the refurbishment work. He said: "I think a lot of members came away feeling very worried. The question needs to be asked, is this project going ahead as it should be? We need a timeframe as to when this is going to be completed." Councillor John Reynolds (Lab. Graiseley), the council&apos;s Cabinet Member for City Economy, said: "The lead contractor for the work being done at the Civic Halls took the time to meet with us and went through all the costs, what the final total would be and the proposed timeframe expected for the refurbishments to be completed, although at present it is still difficult to identify exactly when this will be. "We are currently monitoring the situation closely and will continue to do everything we can to keep people informed." What are the significant building issues at the Civic? The building defects are significant and require immediate attention, such as roof repairs and re-tiling, lift replacement, building fabric and parapet repairs. Significant structural changes are required to accommodate the extra weight of mechanical and electrical equipment, as well as repairs to the fabric of the building. Security, alarms and emergency lighting also requires comprehensive replacement. And the additional counter terrorism measures, following recent national events, have impacted on the cost of the scheme too. The original improvement scheme also included increased seating through new balconies, improved and new bar and hospitality areas, ventilation, lifts and better access to the Wulfrun Hall.